HomeArticlesBehind the Scenes: Shipped Used Batteries to Recycle? What Happens Next? 1 — Shipping. The process starts when collection sites have batteries ready for shipment. Collection sites can ship used batteries using our bulk shipment option or box collection kit option. However, most sites use our specially designed, patented Call2Recycle box. These boxes have a Special Permit from the U.S. Department of Transportation which incorporates requirements to make it easy to collect and ship in the U.S. We have equivalent certificates and approvals from Environment Canada and Transport Canada to help simplify battery shipments. Many sites tell us one of the best things about our program is that with a few flips of the cardboard, the collection box can be converted into a shipping box. The box also features a bar code with the site identification number and a pre-addressed/pre-paid shipping label. More on why this is important in the next step. 2 — Sorting and reporting. After we collect batteries from our retail stores, businesses, cities, towns and government agencies, they must be sorted before any type of processing and recovery can occur. When each box is received, sorters record details about the weight and battery chemistries. Sorting is a critical step. Not only does it prepare the batteries for the next step of recycling, it allows us to collect data about what is being recycled. Are collections of some battery types increasing? Decreasing? Which sites are collecting more batteries? We use that data to spot collection trends, plan future resources and generate the reports required by regulatory agencies in the U.S. and Canada. We also send reports to our collection sites; they can use this information to evaluate individual site performance and target under-performing sites for training or public education. Municipalities with zero waste programs use our reports to see if they are on track to meet their goals and to adjust their recycling efforts accordingly. 3 — Process and Recovery. After sorting, the batteries are ready to be processed. Specific chemistries are shipped from the sorting facility to the appropriate specialty processor that recover usable materials including metals. 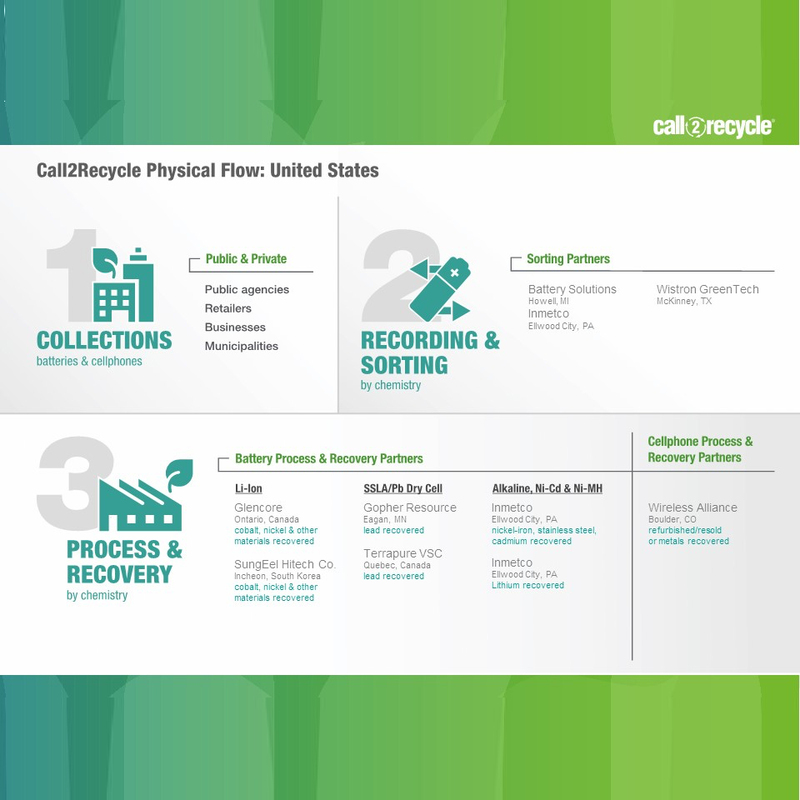 Call2Recycle has a network of processing facilities across the U.S. and Canada. For example, INMETCO recovers nickel-iron, stainless steel and cadmium from Nickel-Cadmium (Ni-Cd), Nickel Metal-Hydride (Ni-MH) and Nickel-Zinc (Ni-Zn) batteries in the U.S., while GlencoreXstrata recovers cobalt from Lithium-Ion (Li-Ion) for both countries. Recovered metals include nickel, cobalt, cadmium, lead, iron and copper, which are used in the manufacture of new batteries, cement additives and stainless steel products. While the recovery process differs for each battery type, most rely on some type of heat or distillation process. Wherever possible, Call2Recycle uses service providers as close as possible to where the materials are generated. The Call2Recycle recycling network includes only responsible recycling partners. These facilities are regularly audited to ensure they follow the highest safety and compliance standards. By maintaining a geographically dispersed network, we can minimize the environmental impact and costs of transportation. However, for select battery chemistries, such as Lithium Ion, there is limited capacity for processing options in North America. Therefore, if there are no processors in North America that meets Call2Recycle’s stringent standards and capacity management, Call2Recycle may utilize processing facilities in other countries. In the U.S., rechargeable battery sorting occurs at Battery Solutions, Howell, MI, at INMETCO, Ellwood City, PA, and at Wistron, McKinney, TX. In Canada, where we collect both alkaline and rechargeable batteries, the sorting occurs at Retriev, Trail, BC, Terrapure Environmental in Hamilton, ON, and Laurentide re/sources, in Victoriaville, QC. Cellphones are sent to the TheWirelessAlliance for refurbishment or recycling. Additionally, Sungeel Hitech Co., located in South Korea, meets all compliance and environmental standards and is the only Call2Recycle service provider located outside of North America. We manage all shipments in accordance with transport regulations and international accords and we do not export any material or byproducts to non-OECD countries per the Basel Action Network requirements for our e-Steward qualification. All sorters and processors are third-party companies that are regularly audited to ensure they follow Call2Recycle’s safety and compliance requirements. 4 — Compliance. To ensure batteries are properly managed and recycled according to the highest standards of responsible recycling, Call2Recycle was certified under the Responsible Recycling Practices Standard (R2), R2:2013. R2 is a set of voluntary principles and stringent guidelines to promote and assess responsible practices in the areas of environmental and public health, worker health and safety, security and the downstream recycling process. Two important prerequisites for achieving R2:2013 status including meeting requirements put forth in the International Organization for Standardization (ISO) 14001 and Occupational Health and Safety Advisory Services (OHSAS) 18001. Call2Recycle was the first program of its kind to receive R2 certification in 2012.Call2Recycle has also been recognized by the Basel Action Network (BAN) for meeting qualification standards. Infographic that shows what happens to batteries during the recycling process. 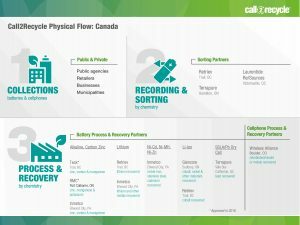 Flow charts that show the U.S. and Canadian recycling processes. Call2Recycle has spent the past two decades refining its recycling process to ensure it meets the highest standards of responsible recycling. 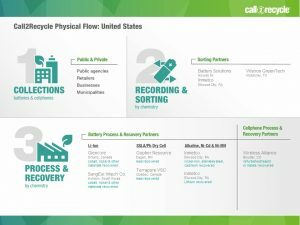 By bringing together diverse groups—transporters, collection sites, sorters and processors—into a streamlined recycling process, we are able to help battery manufacturers comply with the patchwork of regulations across North America and protect the environment by eliminating harmful waste disposal practices. Equally important, the Call2Recycle program helps organizations publicly demonstrate their commitment to environmentally sound battery recycling practices and share them with their communities and stakeholders. Our role is to work behind the scenes to coordinate the process—from collection through recovery.